After more than forty years in the music business, Bruce Springsteen has decided to branch out. The Boss has plans in the works to write a children’s book, and this week sources revealed he is headed to Netflix to take his first scripted acting gig on the streaming service’s original series Lilyhammer. Lilyhammer’s third season should actually be filled with reunions for lead Steven Van Zandt. Not only will he be reuniting on the small screen with his E Street Band Partner Springsteen, he’ll also be teaming up with his Sopranos co-star Tony Sirico. No offense to Tony Sirico, but the Springsteen casting is what really has us jazzed. I’m not sure what might make a 64 year-old man suddenly want to jump into acting, but I like it. According to Deadline, the new season will feature Van Zandt heading back to the United States, where he comes into contact with Springsteen, who will play the owner of a mortuary in the guest role. The mortuary will be located in New York, which means we won’t have to see Springsteen attempt any sort of Norwegian accent. Technically, Springsteen has been on a set, before. Back in 2000, he appeared as himself in the movie High Fidelity. Regardless, this time around, he’ll have a character and a costume, and we can’t wait to see how the gig goes. 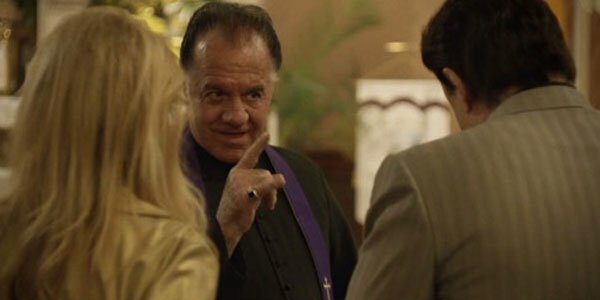 On the opposite side of the spectrum, Tony Sirico will be joining Lilyhammer in a recurring role. In The Sopranos, the two played Tony buddies, but in Lilyhammer, Sirico has popped up as Frank’s brother, a priest in New York City (fun side note—Sirico’s brother is a real-life priest). He only appeared briefly during Season 2, but since his status is now recurring, I’m guessing he should pop up more during the show’s third season. Lilyhammer is Netflix’s first original series, and while it’s not as popular as House of Cards or Orange is the New Black, it apparently gets enough buzz that the streaming site wants to continue to move forward with the series. Lilyhammer is a play on the American pronunciation of Lillehammer and follows Van Zandt as a member of the American mafia who is sent to Norway as a member of the Witness Protection Program. Through the first two seasons, Van Zandt’s character, Frank, has fallen back into various criminal enterprises and behaviors, which seem all too likely to continue during Season 3. Lilyhammer is expected to be available for streaming on Netflix before the end of the year. However, Netflix hasn’t been forthcoming about a premiere date at this point. We do know that the show is already shooting, so hopefully, we’ll get to see an E Street Band and Sopranos reunion sooner rather than later.